A trend that's starting to catch on among pet owners is worrying many veterinarians. More and more dogs and cats are finding raw food in their bowls, says The Early Show's resident veterinarian, Dr. Debbye Turner. to co-anchor Julie Chen that the raw food diets consist mainly of beef, chicken and lamb. Most are commercially prepared. They also contain vegetables, fruits and grains. A twist on them is known as "Barf," which stands for biologically appropriate raw food. It used to be known as bones and raw food. The meats generally come in little patties, or bricks, which are frozen. But because this is raw meat, you have to treat it as raw meat, Turner cautions. There's also a freeze-dried version, which you don't have to refrigerate. And organic chicken is available. Turner says proponents of raw food diets "sing their praises high to the heavens and back. They say that it keeps the animal healthier and they'll live longer. They'll go to the vet less. Their coat will be shinier. They'll perform better, they'll have a better immune system, their teeth will be cleaner. They have enzymes that help their immune system. They tout it to the rooftop and back, saying wild canines and felines eat raw foods. So our pets are made to eat these type of diets." But, Turner stresses, most veterinarians have huge concerns, and they fall into two basic categories: nutrition and safety. "First of all," Turner points out, "there has been no study that proves that these diets are more healthful for them. A cat's diet and a dog's diet have very specific nutritional requirements. Some of the studies are having hard time proving that these are nutritionally adequate for pets. "As for safety, this is raw meat, so there's bacteria involved. There are some hygiene issues. It can make your family sick from handling these improperly, as well as making your animals sick." Turner notes that some believers say raw meat diets are no different than handling the raw meat that we do when we cook for our families. "The trouble is," Turner says, "we don't do a good job with that with our own family and so probably won't do a good job with this. These things have to remain frozen. You have to keep all the surfaces clean. You have to wash your hands. The difference is you cook the meat for your family. So that danger goes away once you cook it. With this, the animal is eating it in its raw form. It can't stay out very long once you thaw them. They don't last long in the refrigerator. So that bacterial component remains there." As for those dogs and cats in the wild who eat raw meat, "There is bacteria in there. Some of the proponents say cats and dogs have a higher acidity, which is a lower Ph in the stomach, making them more impervious to the bacterial component here. "But the truth is, many bacteria develop a coating, if you will, so they can make it through the stomach without being killed, then set up an infection in the small intestine. Concerns include e coli, salmonella and even parasites." And freezing the raw meat "might make the bacteria inactive in the freezer. But as soon as you thaw it, most of those bacteria become active as well." Many of these raw foods include bones, but Turner says they're generally ground up, so they're not a big concern. But bones in their natural form could be big chunks, and can break teeth or lead to severe damage in the small intestine, which could prompt a surgical emergency. 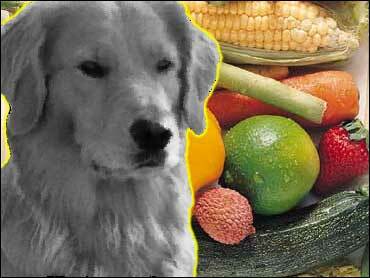 Bottom line, Turner says: Check with your vet before putting Fido or Morris on a raw food diet.